On the basis of its analysis, AIReF concludes that the minimum increase of 0.25% should be applied to contributory pensions in 2017, as stated in the Spanish General State Budget Law for 2017. AIReF has to issue an opinion on the figures used by the Spanish Ministry of Employment & Social Security to determine the applicable Pension Revaluation Index (PRI) for each year. AIReF has to determine if the values used to calculate the PRI included in the draft General State Budget (GSB) are realistic and if the PRI calculation formula is applied correctly. The improvement in the transparency of the information provided by the Ministry of Employment & Social Security for the PRI calculation is viewed very positively. For the first time, and as stipulated in the current legislation, the draft GSB includes the information necessary to calculate the PRI in the Economic and Financial Report on Social Security. 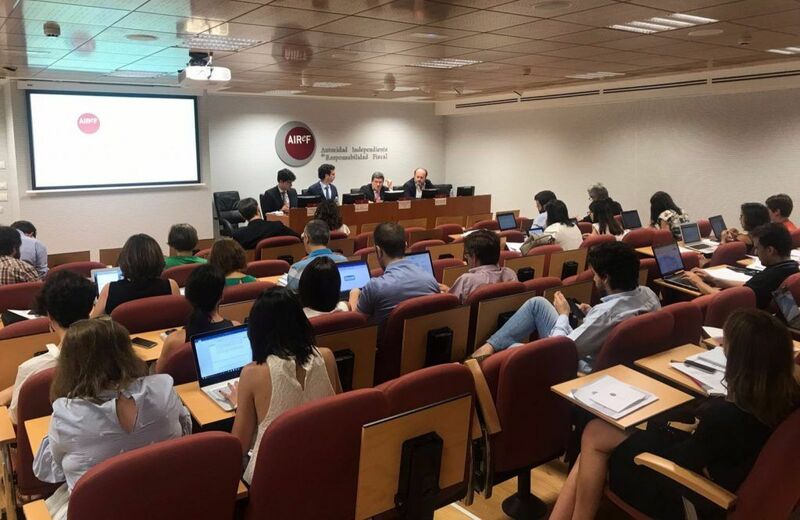 In addition, the Spanish Ministry of Employment & Social Security (MEySS) has sent AIReF more detailed data from these series and a sensitivity analysis of social contributions to the macroeconomic environment. Although its content should be further detailed, given the expected evolution of income and expenditure from the pension system in the medium term, the method applied by the MEySS to project the PRI with limits applicable in 2017 is considered adequate. The effective PRI (within the legal limits) is maintained at the legal minimum in the medium term in the absence of measures. Under the assumptions used by the Ministry and AIReF, the effective PRI does not exceed 0.25% during the 2018-2022 period. For 2017, income forecast falls outside the confidence bands of AIReF models, while expenditure forecasts are more realistic. However, the likelihood of materialization embedded in official revenue growth forecast increases as the time horizon enlarges. In terms of deficit, the MEySS forecast is considered very unlikely during for the 2017-2018 period, although the relative optimism with respect to AIReF models decreases as we approach 2022. The MEySS projects a theoretical PRI (outside the legal limits) of -3%, consistent with AIReF estimates. In addition, if the Ministry resolution method is applied but using the values projected by AIReF, it implies a 2017 PRI of 3.5%. Finally, if AIReF forecasts are used with the iterative resolution method, without taking into account the thresholds defined in the Law, the calculated 2017 PRI is 2.9%. In all cases, the PRI obtained is close to the -3% and less than the 0.25% included in the current standard as the minimum increase applicable to contributory pensions for Social Security and State Pensioners.